On Wednesday it was the 30th year anniversary of Grease Lightining coming out in the cinemas… so me & four friends went along for a laugh to go and watch it at the deluxe screen [can i get an oooh?] at our local cinema. 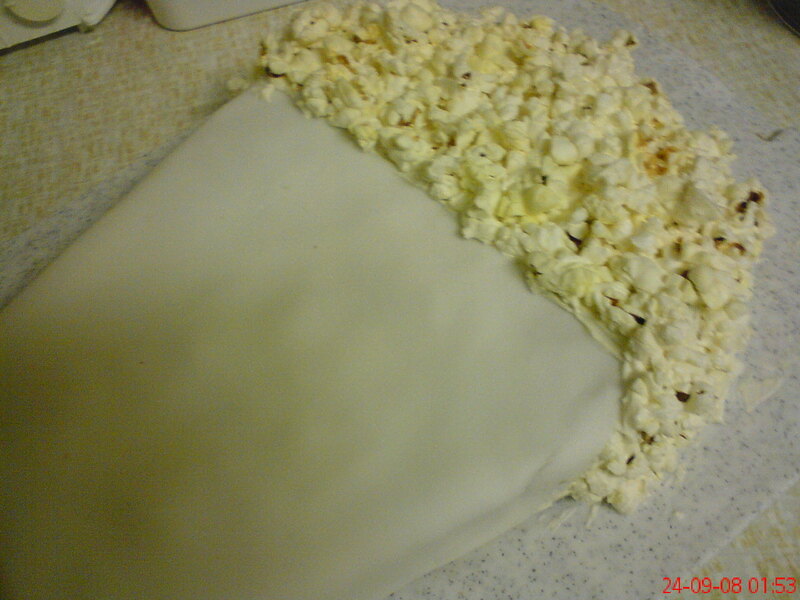 To keep with the theme of cinema, i decided on making a… wait for it… POPCORN THEMED CAKE!! I then made a considerable amount LESS buttercream than i had in that particular gateau, as it was only required to attatch the popcorn to the cake; I can just remember how long the mass leftover buttercream was taking up the fridge for after our last attempt! The icing was bought ‘ready to roll’ and the popcorn was popped at home in the microwave. We boiled and sievved some [delicious] apricot jam, which we coated the cake with once it had been cut into shape; we didn’t however have time to colour the remaining icing, cut it into strips and make the typical ‘stripy red-and-white’ popcorn cone. Never mind!!! Who let DAD loose in the kitchen? So this is… a cobbler, you say? Need I really explain why my Dad does not usually cook? How can I put it any better? 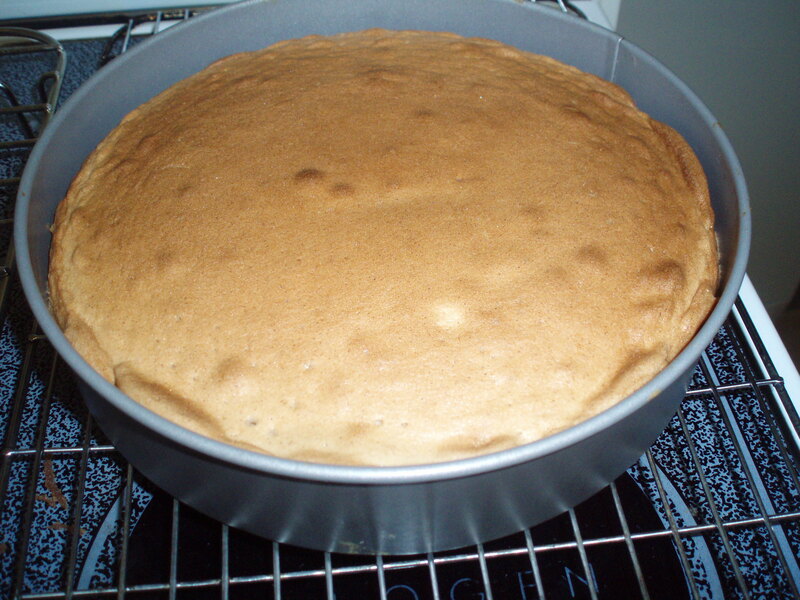 I think you get the jist of what our cake revolves around… But don’t go thinking that this is any ordinary banana cake. Three layers of scrummy surprises await you inside. So let’s dig in! For more info on the three layers themselves, feel free to visit the post below, but as for the filling – now that was the fun part!! We took one egg yolk and thoroughly whisked it [in a Starbucks mug, no less] with 2 or 3 heaped tablespoons of sugar. We then mashed half a large banana. [or should I say whisked a banana, as my original plan to mash the banana with a potato masher didn’t quite work out… but that’s another story, tehe.] Okay, well we then whisked half a banana with half the mug of this yummy egg-yolk-and-sugar mix, and did the same again so that we had two mugfuls. At this point it was time for the butter, which had been sitting in the bowl waiting to adjust to room temperature, to get whisked too. So we whisked it by itself first, then added sugar, bit at a time, before adding the banana mixture. Which was a very slow process, let me tell you! I had to dollop it in by the spoonful whilst the electric whisk continued to do it’s stuff, not to mention stopping the machine every few moments to scrape everything through with my handy spatula. It sure was worth it though!!! What we ended up with was a light and extremely delicious banana buttercream. Not too buttery, not too sugary, with just the right amount of banana flavour in there. Perfect for our cake!!! Speaking of which, it was time to sandwich my layers together. 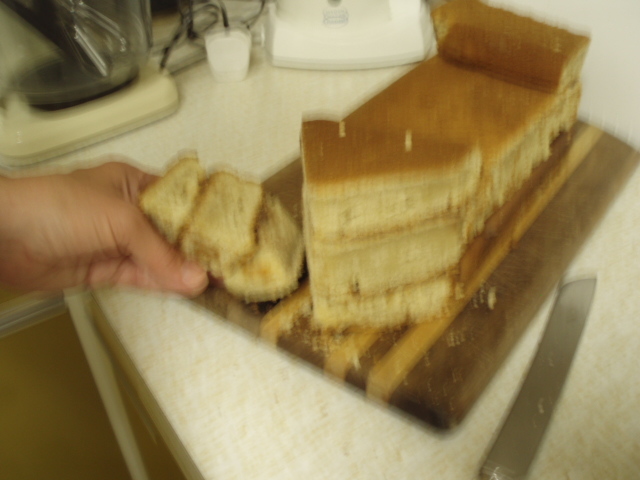 Layer No.1 went down on the cake board: A normal sponge cake with just the subtlest hint of cinnamon, and then our lovely banana-cream went down on the cake. We didn’t hold back on the banana! Once we had finished a layer of banana-cream, we layered thinly sliced bananas over the top… but we were worried the bananas might brown, so we soaked them in a delicious Polish Honey Liqueur first!!! Mmm mm, those banana slices sure were tasty. Above the banana slices went Layer No.2: A normal sponge cake with just the subtlest hint of cocoa, to give it that warm brown colour. [The bottom of which was just scraped with banana-cream, to make sure it was sandwiched securely] We continued this process of layering until we reached the top, which we covered with the remaining banana-cream [after coating the sides first, of course] – the end result of which was an appetizing creamy-coloured cake… that packs a banana hit! It took me nearly the entire month to finally do something about it… Looks like I’ll be entering this event ‘stylishly late’. Whilst the recipe may be new, the flavour combinations have atleast been previously tried and tested. You may be surprised to find that cinnamon, ginger and banana are three flavours that really compliment each other… dare I say perfectly? I can barely believe this combination hasn’t been stumbled upon before! 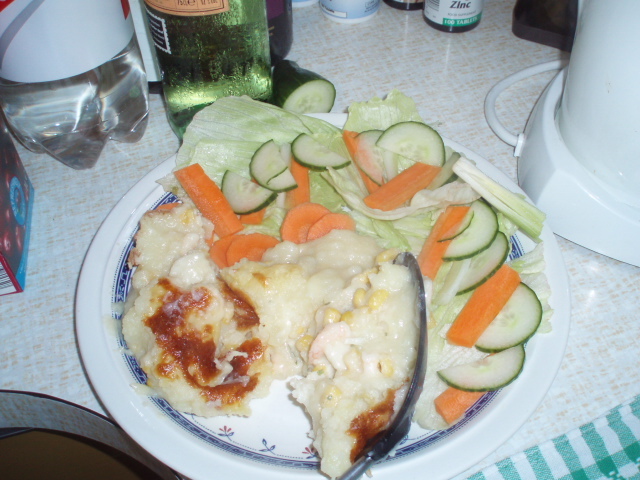 We simply CAN’T have a fish pie without prawns! I mentioned in my last post that we had recently been on holiday – we were staying with old friends in their house by the sea. I’m planning on posting a few more entries on the holiday itself [it was fantasitacular, as was the food!!] but first, I’ve just got to write about the first ever recipe taken out of my brand-spanking new book, which Margie got as a present for me whilst we were up there. I’m going camping in France later today, and as this may be the last half-decent meal I have in over a week, I promised myself I’d bake something worth remembering – but did i succeed? 100g/ 3 and a half oz butter. 50g / 2 oz Cheddar cheese, grated. Whilst the egg and the potatoes were boiling, I placed my fish in a shallow frying pan [after pouring in half a litre of water to see if the milk would fit with it in there] then poured over a third of my milk and added the shallotts. I brought this to the boil and simmered for 10 minutes until the fish was cooked, then removed the fish with a slotted spoon and placed it in a baking dish. 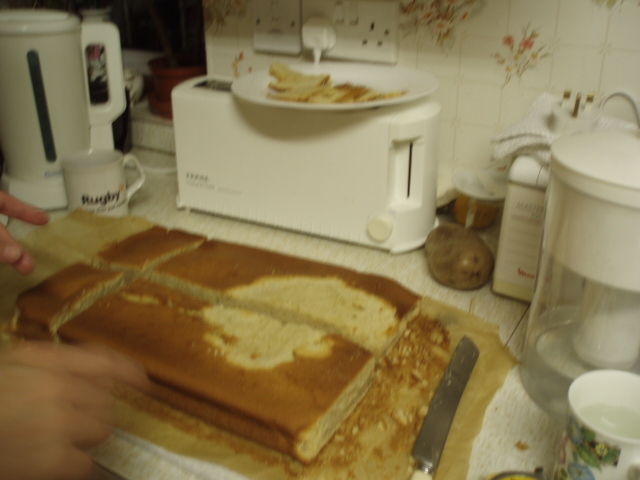 It was meant to be a 1.4 litre baking dish, but I think we used a slightly different one – ours was square and deeper than the oblong one in the picture. Strain the cooking liquid and reserve it for later. The potatoes should be soft by now, I got rid of the starchy liquid they were in and mashed them with 40g of the butter [1 and a half oz] and 2-3 tablespoons of the remaining milk, then put them to one side for later. At this point the prawns went in, or should i say on – you’re supposed to arrange them on top of the fish until it is covered, i think. However, as i have mentioned we were lacking in the cod department, so my prawns sort of filled in all the gaps where there wasn’t enough fish 😉 I wasn’t so keen on arranging the egg on top, as the recipe indicated to do at this point, as nobody in my family likes egg. Apart from Mother that is, so I arranged the egg on top half of the pie, so that she could have that part of the pie all to herself, and the rest of us could snack away on the other half. 😀 Ingenious, eh? Don’t forget to sprinkle some parsley over, it really makes a difference! 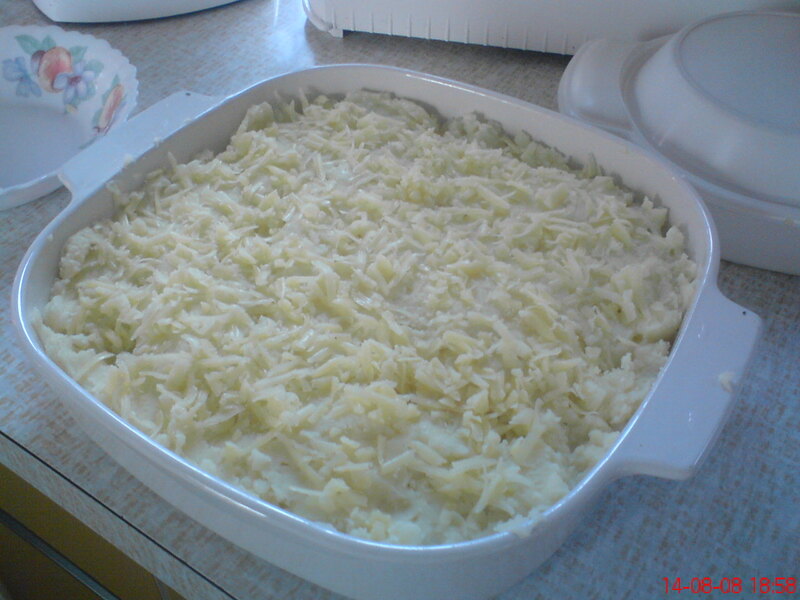 …Spreading the mashed potato over the top of the pie, and sprinkling over the grated cheese. At this point the pie finally looks nice, especially if you own a potato-mashing machine like the one that Rick uses! Bake in the preheated oven for 30 minutes until it is crisp and golden, after which you can leave to cool in the tray for as long as it takes before you serve it – the heat keeps surprisingly well. These were baked in my, that’s right, brand new cake tin! A present from mother, who seems to be a lot more open to cooking and baking than she used to be. 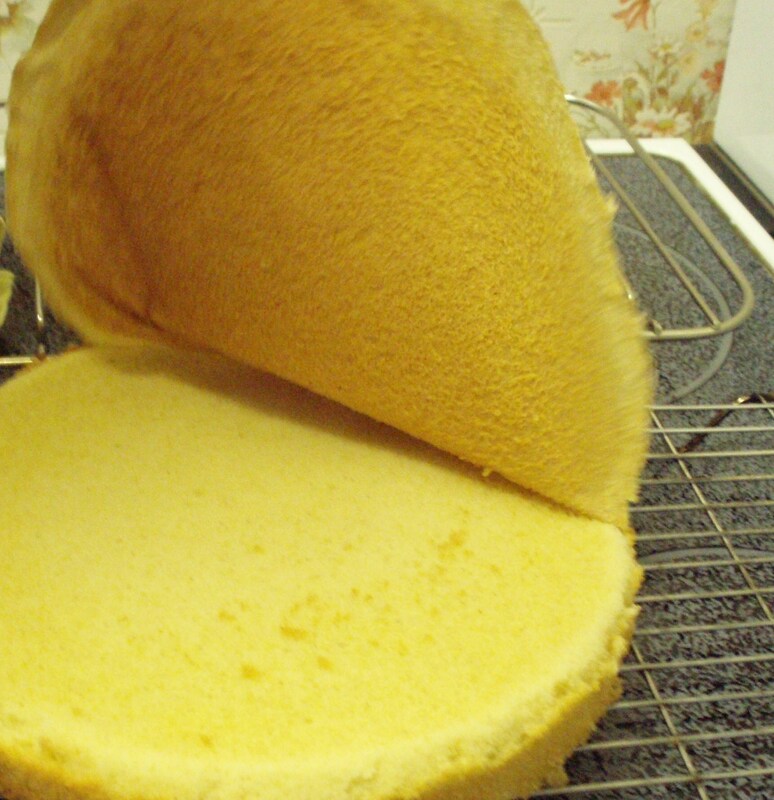 It was bought whilst we were on holiday with friends, after the incident with the lemon shortbread slices where we discovered [to my horror] that we didn’t own a single cake tin that wasn’t round. 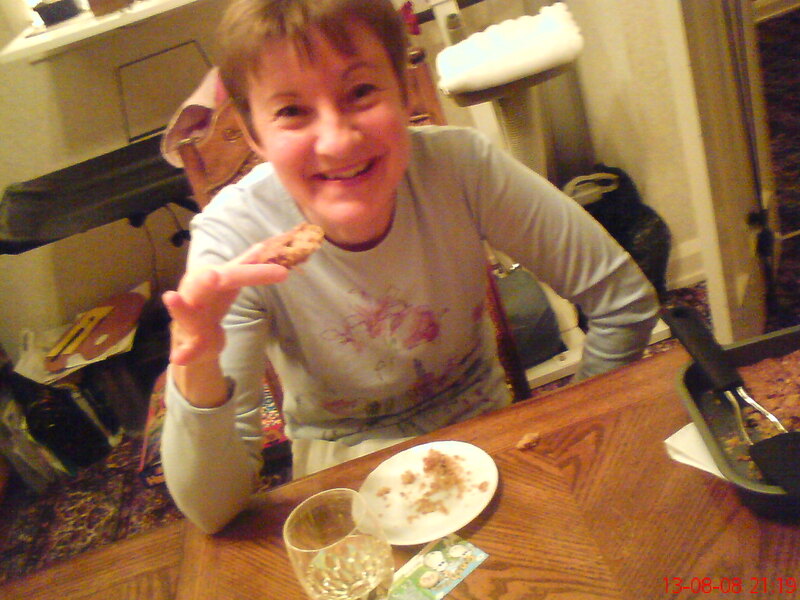 We had to postpone the baking of the biscuits until after we had visited my lovely Babcia – a days worth of chores, pound-shop toffees and attempts to understand Polish were not in vain though, as we left [late] that evening, car boot piled with rusting bread tins. A large handful of dried fruit, such as sultanas; raisins and candied citrus peel. Cecilia assisted me in stirring the mixture as Mother poured the oats in, a little at a time. 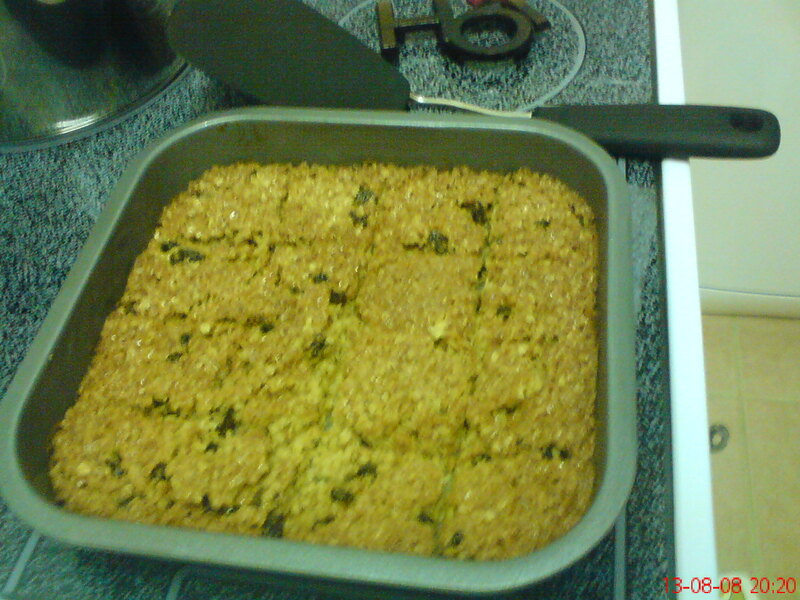 Coat the oats thouroughly, the whole mixture should be gooey and golden. Dollop the mixture into a greased 20.5 x 20.5 [deepish?] 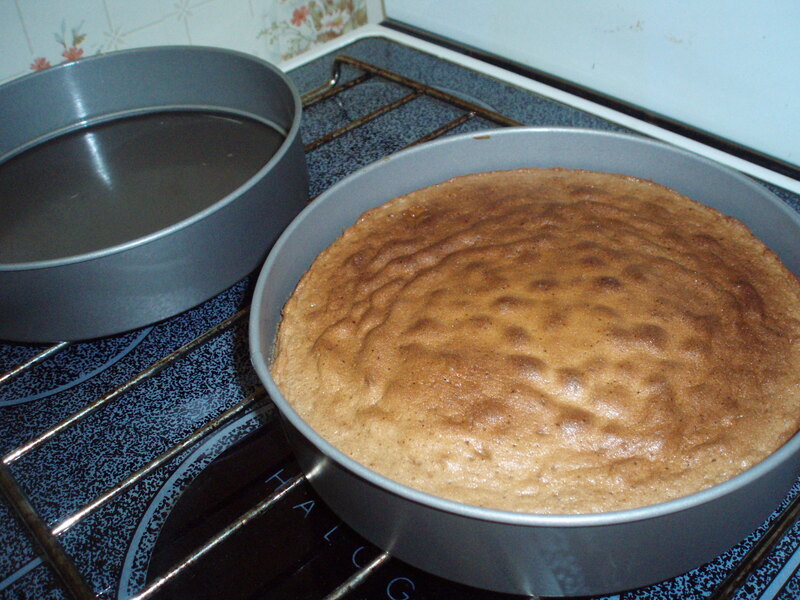 square cake tin, and press it into a level layer that covers the entire of the tin’s base. Bake for 15-20 minutes until golden. Don’t worry that it is not set when it comes out of the oven, the heat melts the syrup and sugar mixture, leaving it squidgy to touch. Cut your fruity flapjack into 16 squares whilst still squidgy, as it’s impossible later! Leave in the tin, though, and serve when cold. Grease [or line with grease-proof paper, as we did] a 20 x 30cm deep oblong baking dish. Put all of your butter in a bowl, steadying it with a damp tea-towel placed underneath. Beat the butter until soft, using Cecilia Spoon. Add your caster sugar to your grated lemon rind [which shouldn’t include any white pith!] Then beat this mixture into your butter, until all is light and fluffy. Stir in your plain flour and fine ground rice using Cecilia Spoon, until the ingredients begin to stick together. You have now made shortbread mixture! Tip it into the prepared tin & press into an even layer over the base, using floured fingers. Prick the dough all over with a metal fork; the prongs should touch the bottom of the baking dish. Bake in the preheated oven for 20-25 minutes, until pale golden brown. 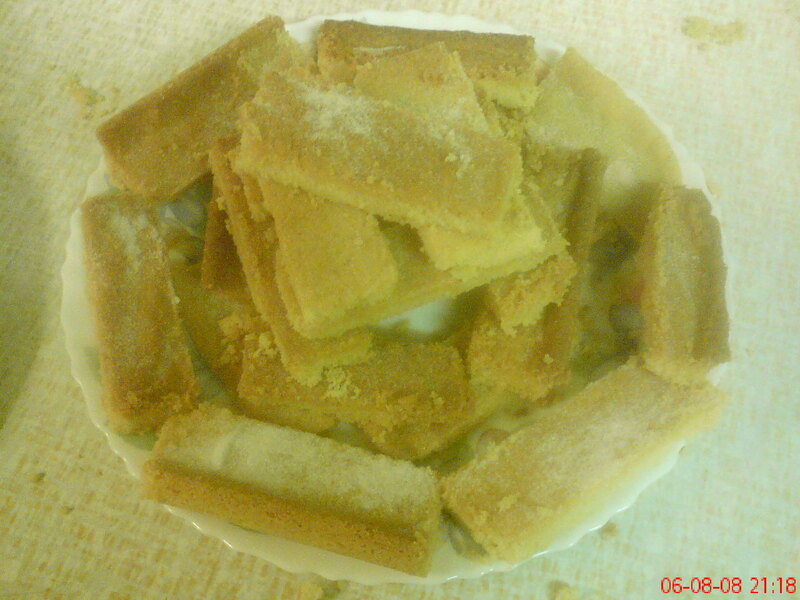 Let the shortbread stand for 10 minutes before cutting into fingers, using a round-bladed knife. Let the fingers cool completely in the baking dish. 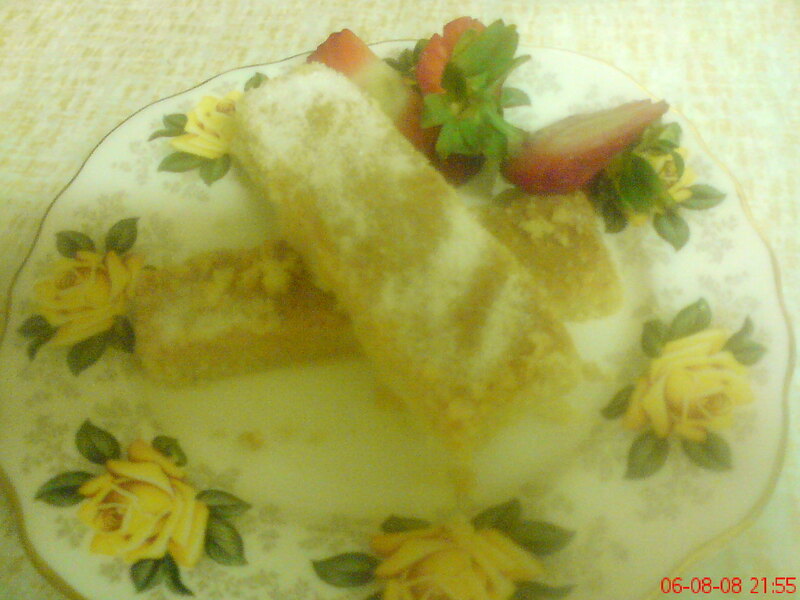 Don’t forget to dredge with caster sugar before serving! These were ever so yummy, and went in no time at all, despite there being so many!! 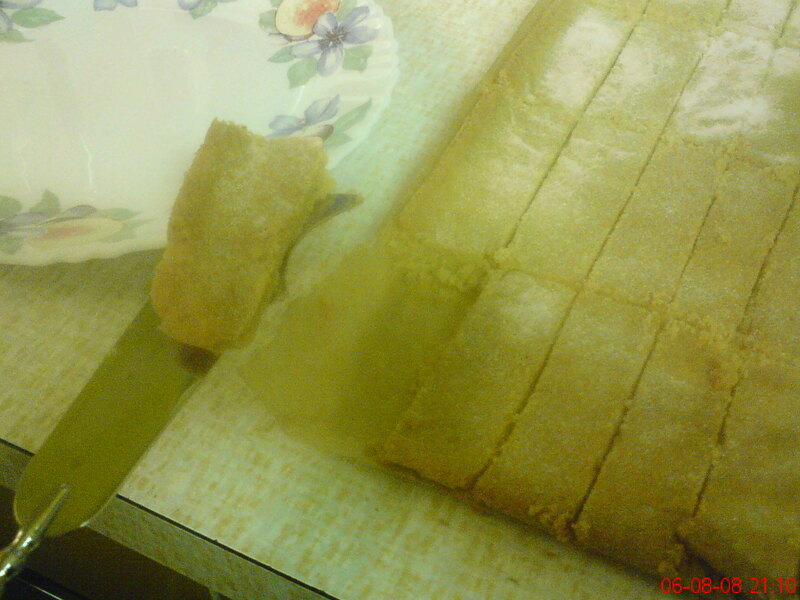 This probably had a lot to do with me descending them upon anybody who entered the house, whether it be the sister’s boyfriend’s father, or the best friend and her mother 😉 I thought they tasted just as shortbread should, and that they defenitely would not be the same without the lemon – however, many commented that they were too sweet, so next time I suggest using less sugar. 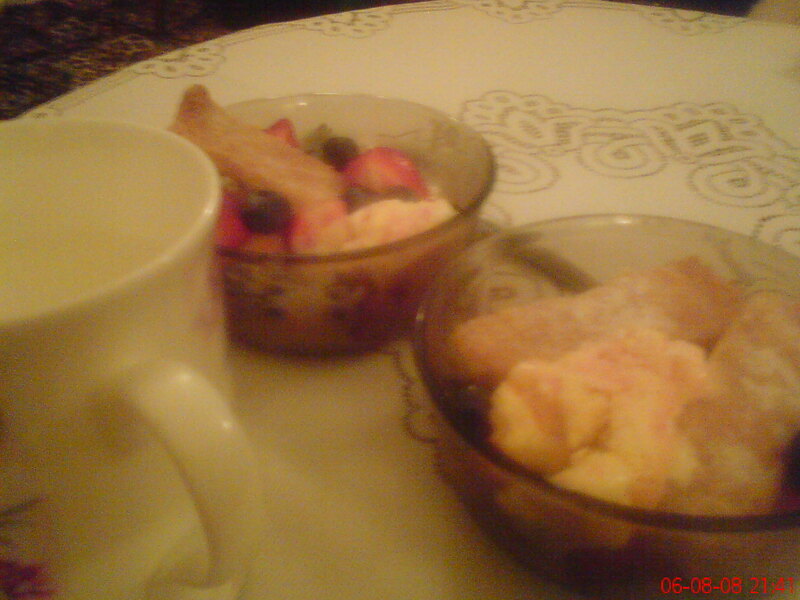 These go perfectly with ice-crem and summer fruits, as you can see below!! My dad is always coming up with new ways to entertain himself. Last month it was creating a garden outside his office at work, then building a picnic basket to put inside… God knows where he finds time to actually do his job, they must dispair at his cement plant! This meant that when, one Sunday evening over lunch, I asked oh-so-innocently: “What does rabbit taste of Daddy?”, he took this as an excuse to build – that’s right, a rabbit trap. What a lovely surprise awaited us when we returned from our holiday by the seaside next week – a vile stench wafting from our fridge, coming from what we soon realised was a dead bunny. I barely wanted to know what Dad’s roommate said when he brought it home to his shared house down in Cambridge; but upon asking I was surprised to discover that they both enjoyed themselves immensely; skinning and gutting the poor things! Well I wasn’t going to let this opportunity go to waste in any case, and jumped at the chance of making some scrummy rabbit dishes. I told mother that we would be making rabbit hotpot, then proceeded to scour the internet, searching for the perfect recipe [meaning the one that we weren’t missing too many of the ingredients!] before writing the two I couldn’t decide between down on a piece of paper in my very best handwriting… before realising that back on the ranch, Mother had been preparing the hotpot her own way. I arrived just in time to see the dish go in the oven – and to eat it later! In answer to my own question… rabbit tastes just like strong chicken, except with a subtle hint of something else. Have you ever been to a farm, and smelt that… farm smell? As you pass the animals? It was as if i could taste that smell in this dish! Unpleasant as it sounds, in some pieces you could barely taste it, and it added a great flavour which was very enjoyable to eat. 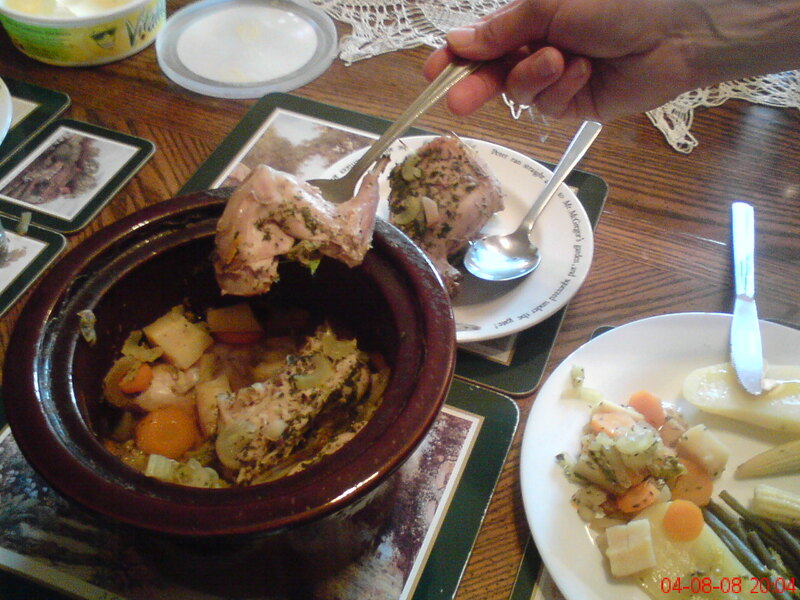 However, in other pieces of rabbit, the taste was much more pronounced and I found it hardly bareable. Where there’s smoke, there’s Emily in the kitchen! Not so much stirring and frying and sticking and burning… in other words, oh dear!! 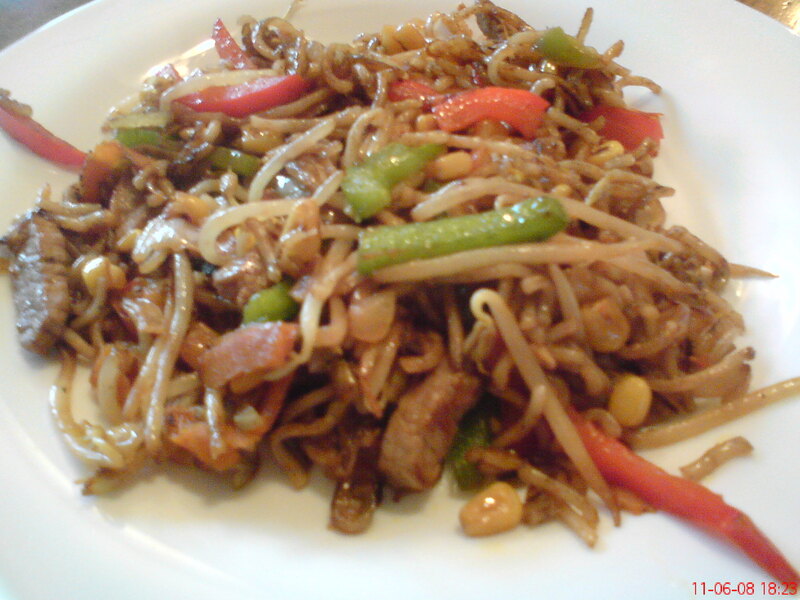 Let’s start from the beginning – my sister was getting fed up of all these new recipes being tried for dinner which she really wasn’t fond of, so suggested a stirfry because… well, what could go wrong? The wok i used was sooo bad. I don’t know what happened, but it was meant to be non-stick and it everything stuck to it! It really got a bit out of control when I was trying to stir the vegetables and noodles and such with my wooden spatula and the spatula got stuck. In the end i had to dump all the not-ready-at-all food onto plates whilst i attempted to scrub the [may i add, never before used] wok with two types of washing-up liquid, bleach and the scrubby side of a sponge – the sponge had to be thrown after, as it was beyond repair. I then continued to stir-fry the food in a non stick frying pan… so much easier! Why, oh why didn’t i do that in the first place? At one point the whole kitchen was so completely filled with smoke that I could barely see – and I don’t even know why! For father’s day, I decided to get my daddy something special. He told me not to buy him anything, and I knew he already was getting everything he wanted from my sister, so what option did I have left but to make him a lovely, humungous cake? Decorations! Such as edible white paper, for the sails; Curly Wurlys; a slab of chocolate for the plank and edible letters to write words with. 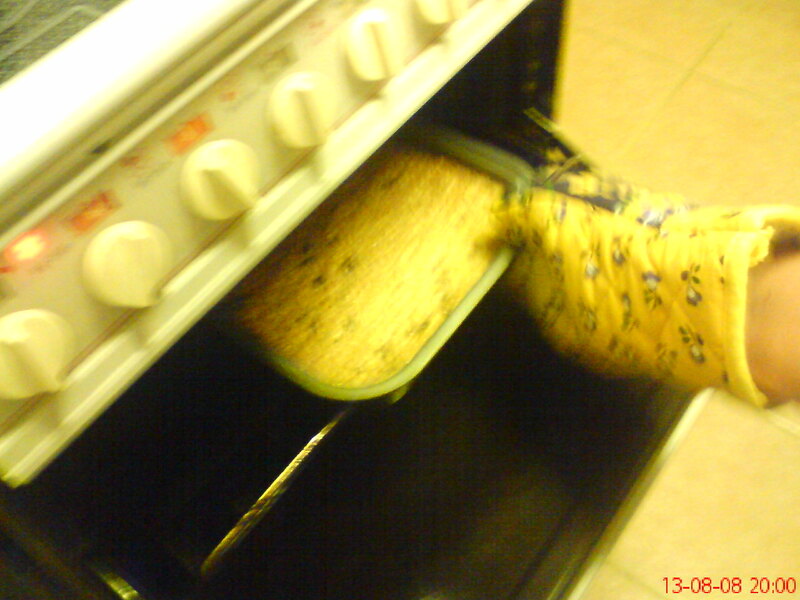 Preheat oven to 180-190˚C ; grease and line a deep 26cm x 36cm baking dish. Beat butter, essence and sugar in a small bowl with electric mixer until light and fluffy. Beat in eggs, one at a time, until combined. Stir in flour and milk, in two batches. 5. Assemble the cake pieces on your prepared board to form a boat shape; secure with 5 skewers. 7. Make buttercream: Beat butter in a small bowl with electric mixer until as white as possible. Gradually beat in chocolate milk powder and half of the icing sugar, milk, then the remaining icing sugar. 8. 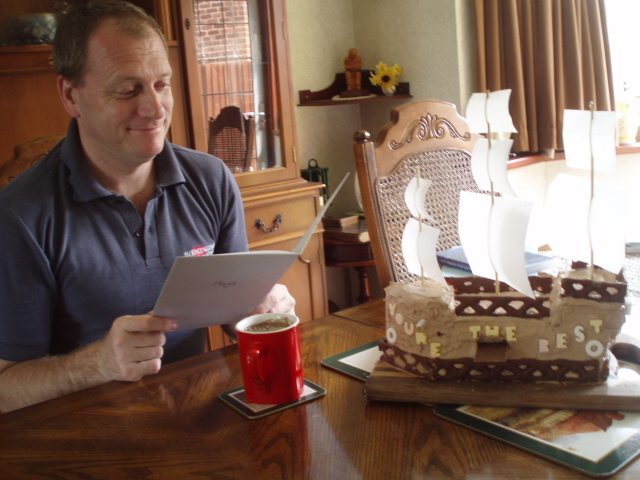 Spread the buttercream all over the boat, then decorate with pieces of Curly Wurly. 9. Write words with the edible letters, position the chocolate plank [I suggest using a 15g cadburys chocolate block for this] and hold it up with a piece of skewer or toothpick underneath, if you’re worried it might fall out. 10. Thread the edible paper on remaining skewers, and position the three masts on boat. Voila!